This report was prepared at the Federal Reserve Bank of Atlanta based on information collected on or before January 8, 2018. This document summarizes comments received from contacts outside the Federal Reserve System and is not a commentary on the views of Federal Reserve officials. Reports from the 12 Federal Reserve Districts indicated that the economy continued to expand from late November through the end of the year, with 11 Districts reporting modest to moderate gains and Dallas recording a robust increase. The outlook for 2018 remains optimistic for a majority of contacts across the country. Most Districts reported that non-auto retail sales expanded since the last report and that auto sales were mixed. Some retailers highlighted that holiday sales were higher than expected. Residential real estate activity remained constrained across the country. 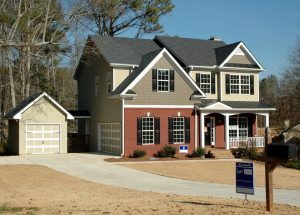 Most Districts reported little growth in home sales due to limited housing inventory. Nonresidential activity continued to experience slight growth. Most manufacturers reported modest growth in overall business conditions. Reports indicated that some manufacturers increased capital expenditures over the reporting period. Most reporting Districts noted continued growth in transportation activity. Loan volumes in many Districts were steady. Among reporting Districts, agricultural conditions were mixed and energy contacts described a slight uptick in activity. Want to get some new clients in 2018? Well then you need the 2018 Appraisal Management Company Directory. I took the time to rewrite most of the marketing information in the beginning of the book as well as add a bunch of AMCs that have been sending me good assignments over the past year. This is the only list that has DIRECT links to the sign up pages. You can’t get this type of information on any state website. Website information, contact email addresses and phone numbers are all provided. This book lays out all the details on how to get signed up with the appraisal management companies and information on creating top ranking websites. Order the book today and you will receive a free search engine optimized website built by internet marketing specialists. 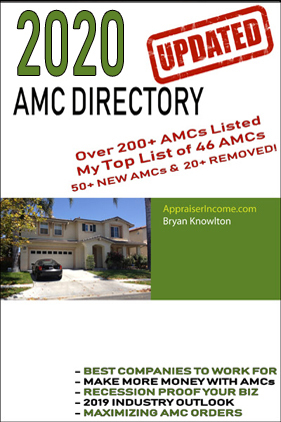 All the details are in the AMC Directory. 90% of my work come from the first 37 on my list! – Get Started Today! posted in Appraiser News | Comments Off on Want to get some new clients in 2018? After a membership vote showing overwhelming support of the merger between ASA and NAIFA, the two organizations have reached an agreement creating one of the largest networks of U.S. professional real estate appraisers. As the effective date of July 1, 2018 quickly approaches, we are sure many questions have been raised. Members of the ASA and NAIFA Merger Task Force are hosting this online webinar, as they answer your questions on topics such as credentialing, dues, designations and chapters. The Appraiser Qualifications Board (AQB) will conduct a Public Meeting on February 1, 2018, in Washington, DC, where input will be solicited on the Fourth Exposure Draft of Proposed Changes to the Real Property Appraiser Qualification Criteria. For the first time, the AQB will also be live streaming the meeting. All are encouraged to attend the meeting in person or watch remotely via live stream. Questions? Please contact Magdalene Vasquez, Qualifications Board Program Manager and Editor at magdalene@appraisalfoundation.org. The Appraisal Foundation is the nation’s foremost authority on the valuation profession. 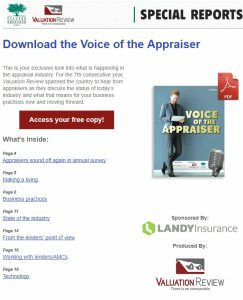 The organization sets the Congressionally-authorized standards and qualifications for real estate appraisers, and provides voluntary guidance on recognized valuation methods and techniques for all valuation professionals. This work advances the profession by ensuring appraisals are independent, consistent, and objective. More information on The Appraisal Foundation is available atwww.appraisalfoundation.org.